It is perfectly possible to share a single Mascot Server between individuals or groups who require privacy for their searches. Mascot Security provides the mechanism to limit access to result reports, databases, and even custom modifications. Mascot security is not designed to be highly secure – a determined hacker could probably find ways around it without too much difficulty – but it is strong enough for a typical research laboratory environment. Note that none of the information on the Mascot Server is encrypted, apart from passwords, so everything is visible to the system administrator, and anyone else who gains access to the files by means of a file share or some other route. This means that, where multiple groups share a server, it is best if they nominate one person to be the system (and security) administrator. Security is configured by a browser-based editor, although you can also edit the XML files directly if this is more efficient for a particular purpose. It is good practice to use the administrator account for administration tasks only. If the administrator also runs searches, they should log in as a regular user using a separate account. Mascot security is role based, which means that rights are assigned to groups, not individual users. Users gain rights through being members of one or more groups. A user will only see a database listed in the search form if they belong to a group that is allowed access. This restriction will also apply to other processes that need to access the Fasta. For example, the result file doesn’t contain complete protein sequences. If a user is able to access a result report that includes matches from a database the user cannot access, they won’t be able to load a Protein View report, because this needs to retrieve the protein sequence from the Fasta in order to generate the report. 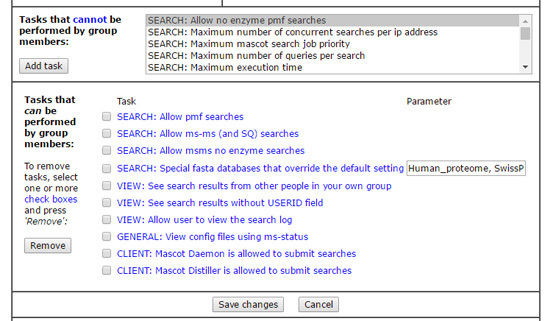 See all search results that don’t have a USERID, such as searches submitted before Mascot security was enabled or the examples used in the help pages. Should always be selected. See all search results submitted since Mascot security was enabled. This should only be selected for the Administrators group. The way the second task works is easiest to explain with an illustration. You are teaching a proteomics course where Mascot is used. Pupils should not be able to see each other’s results, so you create a group called pupils where the first task is missing, meaning members can only see their own results. As the instructor, you want to be able to see everyone’s results, so you create a second group called teachers where the second task is selected, and make yourself a member of both groups. It is OK to select VIEW: Allow user to view the search log for all groups on a shared server. When a user views the search log, they only see searches where they are entitled to view the result report. This minimises ‘clutter’ and avoids the possibility of something being displayed in the log that is confidential, such as the search title. You can also make a modification private to selected groups. This only applies to a custom modification, created locally. You cannot make a standard modification taken from Unimod private. In the modifications module of the configuration editor, if you create a modification, you’ll see a privacy tab in the editor. Check the box for private and you will see controls that allow you to select which security groups can see the new modification. In a future article, we will look at how Mascot security can be used to control usage of server resources, such as limits on the size or type of search, how many searches a user can have running simultaneously, search priority, etc.